GEPETO BRINQUEDOS: NOVIDADES INÍCIO ABRIL 2008 - ORIGINAIS ANOS 60. NOVIDADES INÍCIO ABRIL 2008 - ORIGINAIS ANOS 60. PARA QUEM GOSTARIA DE TER AS PEÇAS ORIGINAIS COPIADAS PELA CASABLANCA NOS ANOS 60. 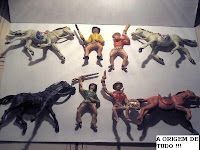 CONJUNTO DE 04 CAVALEIROS - RARIDADES ESPECIAISPARA CLIENTE GEPETO. NOVIDADES INÍCIO DE ABRIL - BÚFALOS ! NOVIDADES INÍCIO ABRIL 2008 - EL ZORRO !! NOVIDADES INÍCIO DE ABRIL 2008 - BRITAINS !